Keith Lamont Scott was shot and killed Friday by police, who were searching The Village at College Downs, an apartment complex, for a separate man with an outstanding warrant. The police have said the 43-year old was carrying a handgun the second time he stepped out of his vehicle, and refused to put down the weapon upon being asked; Scott’s family says he was in his car reading. Scott, a father of seven, is now dead. Wednesday night, protests broke out in Charlotte. We—the press, the public, Scott’s family, Charlotteans, and everyone else that wasn’t on-scene—have no proof either party is telling the truth about what was in Scott’s hand prior to the abrupt ending of his life. Thanks to a bill recently signed into law by North Carolina governor Pat McCrory, that crucial bit of information will remain buried for as long as the Charlotte Police Department deems fit. On July 11, McCrory signed into law House Bill 972, which aimed to restrict the ability of North Carolina citizens to obtain dash and body cam videos from the police department. As of Oct. 1, when the law will go into effect, police body camera footage will no longer be considered public record—even if a citizen is filmed by the body cam footage, they will soon need submit a written request for approval to the necessary police chief or sheriff to view the video privately. If denied, the person filmed will have to go through the court system to appeal for access to the video. Luckily for McCrory, House Bill 2 has been a colossal dark cloud for the state of North Carolina since its passing in March, so the majority of national attention directed his way has focused on HB2, which denied LGBT rights, dialed back an already-lax anti-discrimination policy, and restricted local government’s ability to set minimum wages. Much of McCrory’s time in public has been spent answering questions regarding the bill driving tens of millions of dollars away from the state, though his campaign has managed to slip a few softballs in there for him. When pressed on the matter by host Don Lemon, McCrory found himself short on time and cut the interview off without offering one understandable answer. Today, Charlotte police chief Kerr Putney held a press conference to discuss Wednesday night’s protests. 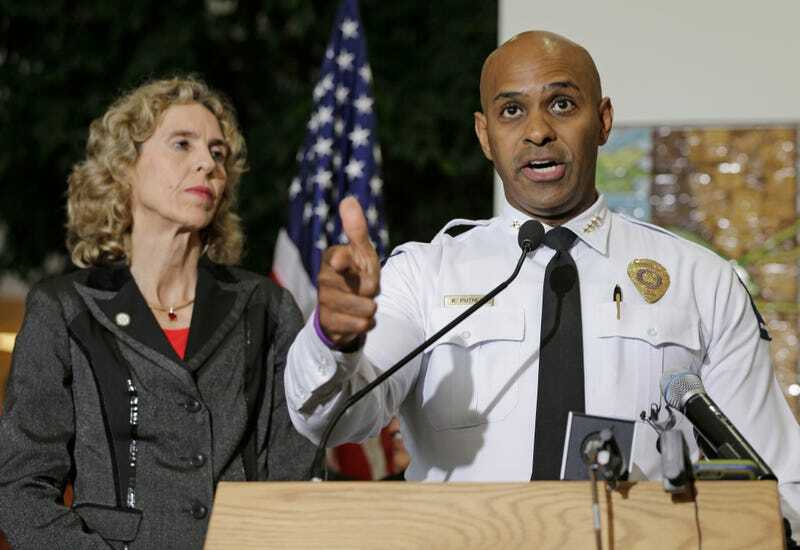 During the course of the presser, Putney reiterated his stance from Wednesday—the Charlotte Police Department does not intend on releasing the video of Scott’s death by police gunfire to the public should they not be required to, which they will not. Instead of video, the public will have to wait for answers to the many questions being posed and trust the N.C. SBI’s investigation into officer Brentley Vinson’s decision to pull the trigger on Scott.